Unfortunately I didn't accomplish all of my Halloween crafting goals. Lack of time, supplies, and inspiration simply got the best of me this year. I can't wait to be in a home (and craft room) of my own. Hopefully we'll find something we like this weekend. We have our eyes on a beautiful Victorian, but as our luck would have it there is a bankruptcy addendum on the property. House hunting and other drama aside, I did manage to whip up at least one costume and make a part of another. One of Elliot's and my favorite books is How Do Dinosaurs Say Goodnight by Jane Yolen and Mark Teague. Using Mark's wonderful illustrations as a guide I created my own pattern, used fleece, a little bit of felt (for the teeth), and some batting (for the tummy and tail) to create a dino suit for Elliot. If you are new to sewing I recommend experimenting with fleece. It is a very forgiving fabric. 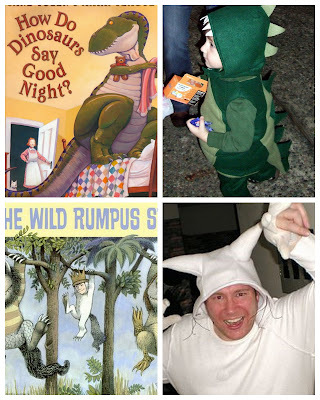 I also used fleece to construct a hat for my friend Jonathan's Max from Where the Wild Things Are Costume. Jonathan added the whiskers for the perfect finishing touch.